Why Upgrade to High Efficiency HVAC? Here Are Five Reasons! As you know, our Shamrock Sale is going on right now, and that can help you get into a new high efficiency system. With this sale, you’ll be able to save money – but is there any other benefit to choosing high efficiency equipment? ENERGY STAR, a branch of the U.S. Department of Energy, says yes, and gives a few reasons why switching is a great choice. Your home will be more energy-efficient. Of course, this seems like a given, considering we’re talking about high-efficiency equipment. But you might be surprised at just how much more efficient it will be. An AC system installed in the 1990s, for instance, is about 50 percent less efficient than today’s air conditioning. That’s a pretty big deal. You’ll save money on your energy bills. Who doesn’t want to see their utility bills decrease? Most people who choose to have high-efficiency air conditioning properly installed in their homes by qualified technicians can enjoy savings on energy bills, even during the hottest months of summer. You’ll help the planet. When you use less energy, you also help prevent carbon pollution are help to reduce other greenhouse gases from being emitted into the atmosphere. On top of that, modern air conditioning systems use a much more efficient and environmentally sound form of refrigerant that does not harm the ozone layer. You can save even more energy. Modern air conditioners are already more efficient than their predecessors. But high-efficiency, ENERGY STAR-qualified systems can save you even more – up to 15 percent! Imagine your energy savings – and utility bill savings – on a system that could be 65 percent more efficient than the one you currently own. You can save thousands when you make the change now. Yes, you heard that right – thousands. With our Shamrock Sale, you can save $3,192 on a new, high-efficiency system. Not only will you get great rebates on select systems, but you’ll also be eligible to receive both a free humidifier and a free Wi-Fi thermostat with a complete high-efficiency system installation. When you combine our offer with special financing (with approved credit), you have a great deal. And, this is our best offer this year – but you have to act quickly. Once St. Patrick’s Day arrives, this pot of gold disappears! Our Shamrock Sale ends on March 17, 2018. To take advantage of this great opportunity – and enjoy a more energy-efficient home, call T. F. O’Brien today at 516.488.1800. 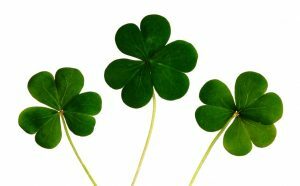 Shamrock Savings from T.F. O’Brien!